A photograph of the Apollo 16 lunar module known as Orion as seen by the Lunar Module pilot in April of 1972. 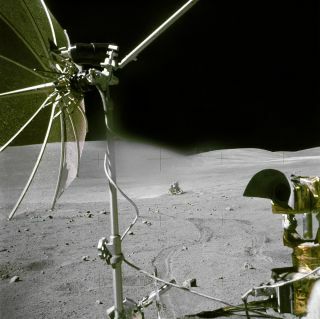 In this historical photo from the U.S. space agency, the Apollo 16 Lunar Module "Orion" is photographed from a distance by astronaut Chares M. Duke Jr., Lunar Module pilot, aboard the moving Lunar Roving Vehicle. Astronauts Duke and Commander John W. Young, were returing from the third Apollo 16 extravehicular activity (EVA-2). The RCA color television camera mounted on the LRV is in the foreground. A portion of the LRV's high-gain antenna is at top left.